The Jaded NYer: Drum Roll, BITCHEZ! Click Here For My Show!! It took me a minute to edit it and get it right, because as previously mentioned, Mari and I are dorks who stayed on the line after the show had stopped streaming, oblivious to the fact that we were still being recorded!! Yes. I, The Jaded NYer pulled a Jesse. My mic was hot and I was too busy patting myself on the back to notice! After sweating about it and checking to see what tomfoolery we were caught on tape saying, I finally heard back from Blog Talk Radio's customer service who oh-so-kindly let me know that this was, in fact, fixable. Because god forbid you all know how nervous I was and that my hands were shaking the whole time. Or that Mari was regretting that she didn't ask clnmike for some Purple Drank because to us, when you mention Georgia, we automatically think of "syrup." 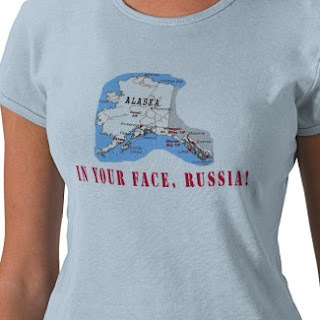 Because nothing says, "Merry Christmas, Grandma" like an "IN YOUR FACE, RUSSIA!" TShirt* from Jaded Tees. Jaded Tees. That has a nice ring to it. ...thanks, in part, to all of you. *thanks to Jack for the TShirt slogan... we make a great team!